DROP DANGLE EARRINGS WITH CZ- The brilliant crystal CZ stones, and 925 Sterling Silver, blend harmoniously with each other making this piece of jewelry illustrious and timeless! Each stone is carefully set into a Silver basket setting with a high-polish plated finish. Sterling Silver DROP EARRINGS - It is the perfect fashion accessory, with the use of real Swarovski Elements, it gives women the assurance that this is of excellent quality and will stand the test of time. A delicate and vintage inspired earrings that is a true standard to any woman's accessory collection that can be easily be transitioned from day to night. These dangle Earrings for women are 925 Sterling Silver earrings and come with a beautiful row of CZ and an exquisite dangle solitaire round cut CZ stone. With the use of real Swarovski Crystal it gives women the assurance that these earrings are of excellent quality and will stand the test of time. A delicate and vintage- inspired earring that is a true standard to any woman's accessory collection. This is the perfect anniversary gift, bridesmaids set, wedding accessory, or best friend gift that says I love you. These are the earrings that she will wear and always think of you in a loving and adoring way. You cannot go wrong adding these beautiful earrings to your collection. 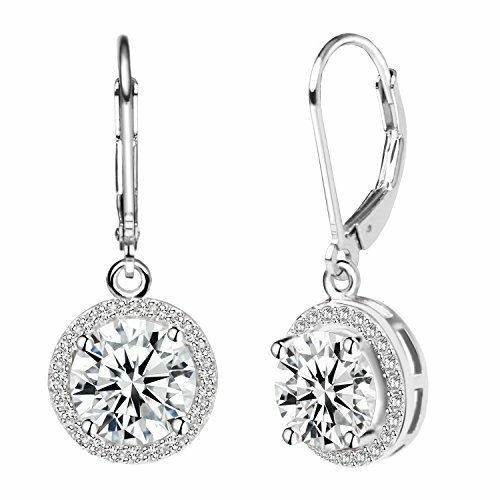 SPECIFICATION:S925 sterling silver hoop earrings featuring bling cubic zirconia.Length: 2.8cm(1.1"), Width: 1.2cm(0.5"). One Earring Weight: 2g. For pierced ears only. DESIGN CONCEPT: With simple design but radiant beauty, these earrings are a stunning addition to any outfit or accessory collection! PERFECT FOR ANY OCCASION:Perfectly suit of a wedding,anniversary,casual wearing,Christmas Valentine gift for friend and more. If you have any questions about this product by Jane Stone, contact us by completing and submitting the form below. If you are looking for a specif part number, please include it with your message.